Boss Ferguson was delighted to win a scrappy affair with Cowdenbeath. 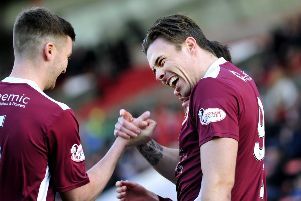 Stenhousemuir boss Brown Ferguson has a happy dilemma to ponder as his side head for Annan on Saturday. While injuries will inevitably bite at some stage of the season, at the moment Ferguson has a full squad to choose form. And that, allied to the fact that Warriors are on an unbeaten run and in decent form, has sharpened competition for places in his starting line-up - a situation every manager will welcome. He said: “We’ve got training to negotiate but there’s nothing from the weekend so we’re up to a fully fit squad which is great. “David Marsh was on the bench at the weekend and he got a week’s training under his belt with no reaction so hopefully he’s getting stronger. “You want competition for places. You want players to have to perform to keep their spot in the team and motivated from the bench to come on and do well. “Everybody recognises that you can only play 11 players. We’ve got a squad of players capable of holding down starting positions so I’m pleased with the headache it causes me to try and pick the right team. Ferguson admitted Saturday’s game against Cowdenbeath was far from a classic - but was delighted with both the win and Stenny’s first clean sheet of the campaign. He said: ““Not every game is going to be free-flowing and from a spectacle it was a scrappy game but it was one we controlled for large parts.